Halloween ComicFest is a similar event to Free Comic Book Day. Started in 2012, the idea is to attract customers to stores near Halloween by enticing them with free holiday themed comics. Some of the comics are small-sized and sold in packs of 25 for giving out on Halloween. Others are full-sized, like an offering from Marvel Comics on October 29, 2016, Darth Vader Doctor Aphra #1. 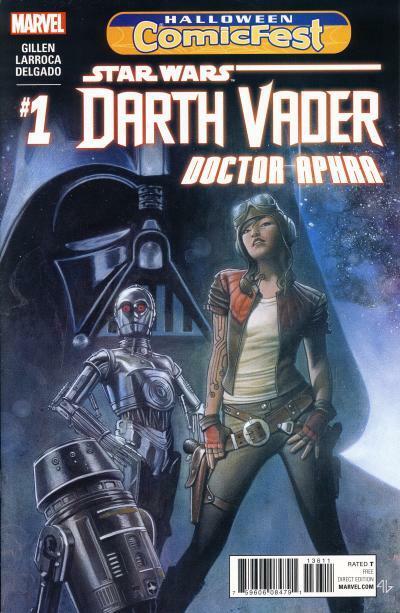 This comic reprints Star Wars: Darth Vader #3 and is timed to promote the new Doctor Aphra ongoing series that is coming out. 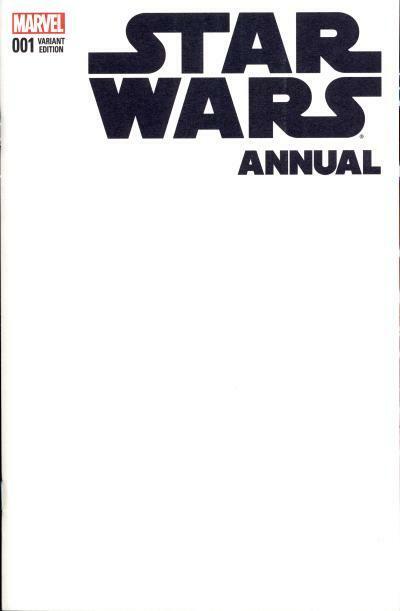 The cover art is the same as the standard cover for Darth Vader #3 with the image cropped at the bottom to make room for the Halloween ComicFest logo at the top. 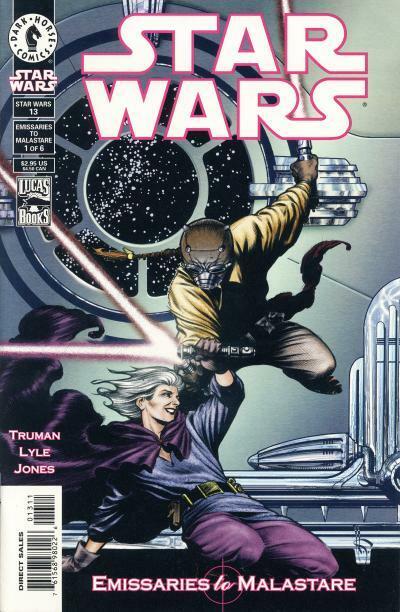 Star Wars (1998) #13 kicks off the 6 part Emissaries to Malastare story arc. The issue begins with the Dark Woman testing A'Sharad Hett in the Jedi Temple. Afterwards, the Dark Woman asks Ki-Adi Mundi if it was true that Aurra Sing, her former Padawan, was on Tattooine and killed Sharad Hett. Ki-Adi confirms it was Aurra. Later, the Jedi Council convenes and picks six volunteers from the council to travel to Malastare to broker a peace between the planet Lannik, Jedi Master Even Piell's homeworld, and a terrorist organization called Red Iaro. 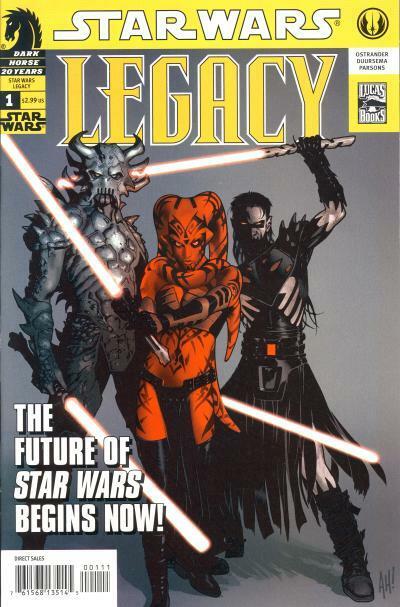 The cover shows the Dark Woman testing A'Sharad Hett in a lightsaber duel. During the duel, the Dark Woman employs unorthodox methods of testing A'Sharad, including insulting his Tusken Raider heritage. In the end, A'Sharad remains calm by citing Jedi phrases taught to him by his father and passes the tests. 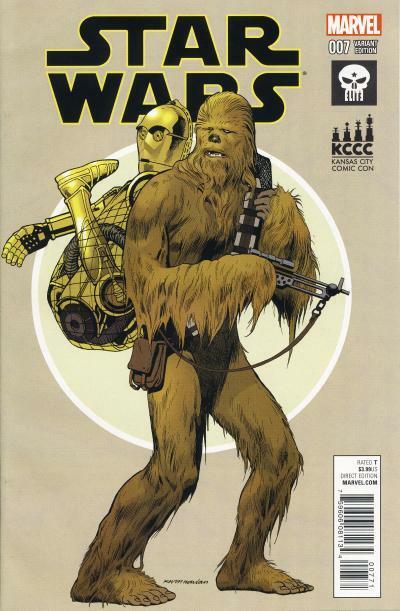 It is the cover to the newsstand edition of Star Wars #13 that is interesting. The UPC box has a sticker. I actually noticed the sticker when I bought this other newsstand copy of Star Wars #13 because the sticker covers up the words "Star Wars". Interestingly, the numbers on the sticker appear to match the numbers printed in the UPC box. It is not clear what is different on the printed copy that warrants the sticker. After some investigation, I believe every newsstand copy of Star Wars #13 has this sticker. 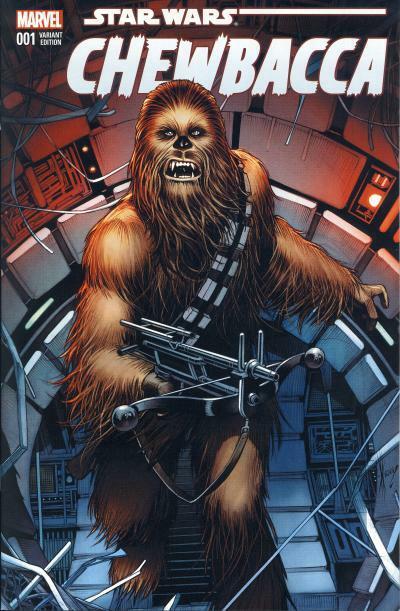 Chewbacca #1 was released in October 2015 with one standard and six variant covers that all retailers were able to qualify for. Only one comic retailer released an exclusive cover, Canada's AOD Collectables. Canadian Dale Keown drew the cover. Keown is best know for his art on the Incredible Hulk title in the early 1990s and his creator owned title Pitt published first by Image comics and later by Keown's own publishing company, Full Bleed Studios. The Chewbacca #1 AOD Collectables exclusive is limited to 3000 copies. Darth Krayt is the main antagonist for Cade Skywalker in the Star Wars: Legacy title. But he first appeared as A'Sharad Hett in Dark Horse's Star Wars #10 from September 1999. Jedi Council member Ki-Adi Mundi is sent by the council to Tatooine to learn why Jedi Knight Sharad Hett has reappeared leading a Tusken Raider raid on Anchorhead. Sharad Hett, a Jedi hero, was presumed dead years earlier. On Tatooine, Ki Adi Mundi is trapped by a Krayt Dragon when Sharad's war party encounters him. Upon learning that his former master Eeth Koth sent Ki-Adi Mundu, Sharad and his 15 year old son, A'Sharad Hett, attack the Krayt Dragon and A'Sharad is left to his own to finish the creature. The Tusken Raiders were hunting the Krayt Dragon to initiation A'Sharad as a warrior of the Jundland Tuskens. Sharad has been training A'Sharad as his Jedi padawan. Unfortunately, shortly after Ki-Adi Mundi learns why Sharad is leading the Tusken Raider's, Sharad Hett is killed along with much of his clan and A'Sharad returns with Ki-Adi to Coruscant to become his padawan. A'Sharad Hett would appear in several more stories in the Star Wars and Star Wars: Republic titles. Darth Krayt's first appearance is in Star Wars: Legacy #1 as the leader of the One Sith. 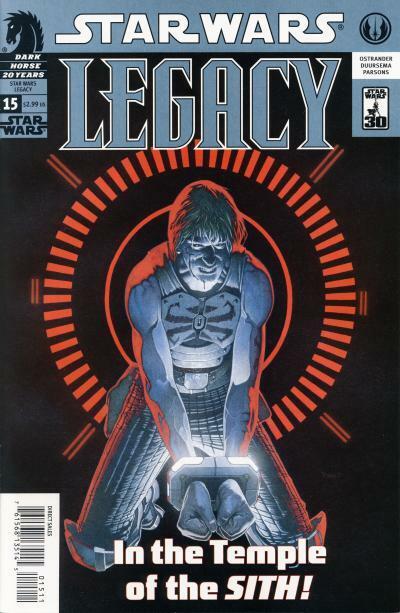 Darth Krayt tells a captive Cade Skywalker at the end of Star Wars: Legacy #15 that he was formerly the Jedi A'Sharad Hett. The inter-connectivity of the Expanded Universe is a big draw for longtime Star Wars fans. Dark Horse was masterful at using characters and situations that otherwise would be forgotten to build a rich experience for comic readers. How cool is it that Dark Horse re-used a supporting character from one era and re-invented that character as a heavy-weight villain in another era? If Marvel can capture even a portion of this technique that made Dark Horse's contribution to the Expanded Universe magical, fans have much to look forward to. Kevin Comics was started by Kevin Picker, an immigrant to Israel from South Africa, who acquired the rights to publish both Marvel and DC comics. 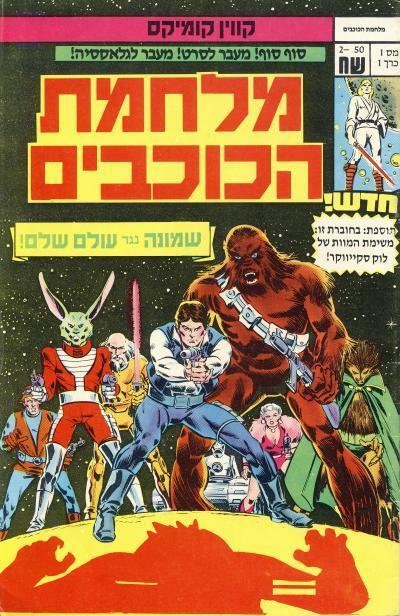 From January 1986 to December 1986, Kevin Comics published מלחמת הכוכבים or Star Wars in Hebrew. 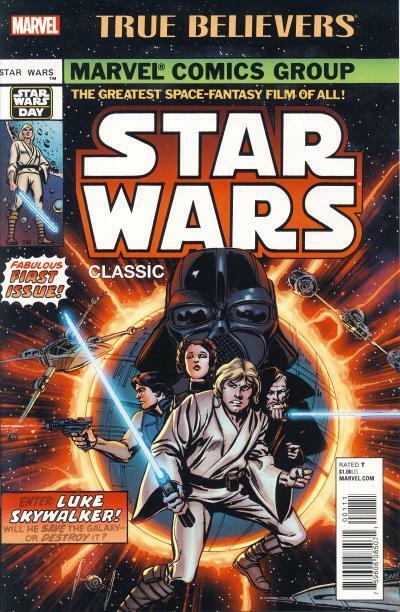 Lasting only 6 issues, these 36 page full color comics contain 2 issues of the Marvel Star Wars series starting with issue #7 and ending with issue #18. There is a 7th issue that contains a compilation of these comics. The art is a mirror image of the U.S. editions since Hebrew is read from right to left. 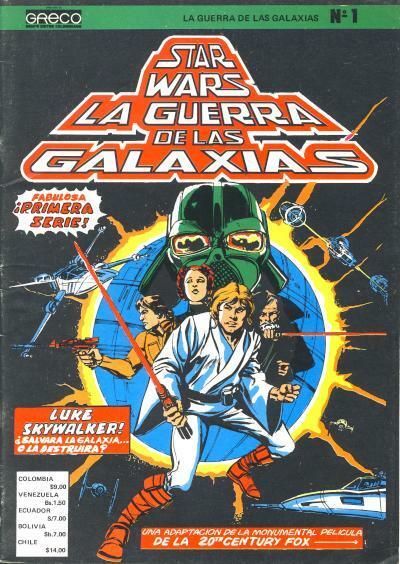 Interestingly by 1986 the branding for products was using "Star Wars" written in English in many foreign countries, but this comic covers shows the title in Hebrew. Many sites had a checklist for the avalanche of variants and exclusive that were released for Star Wars #1 in January 2015. This was also true for Darth Vader #1 and Princess Leia #1. 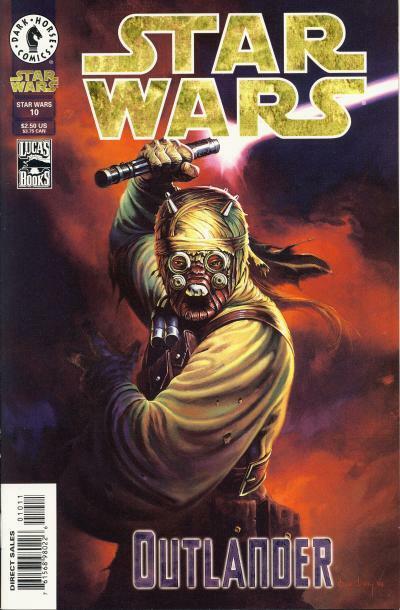 By the time Star Wars #7 was released in July 2015, the continuous release of alternate covers became so commonplace, sites were no longer tracking these covers. Marvel has even released variant covers that many collectors are not aware of like the Han Solo #1 Scholastic Club or the Poe Dameron #1 Calgary Expo exclusive covers. I believe the Kansas City Comic Con exclusive falls into this category. It was released without much fanfare and unless you happen to be actively following Marvel's Star Wars publications, it is one that I feel would be easy to miss. None of these exclusives are shown on the Marvel Wookieepedia page for the respective comic; instead Wookieepedia show just the incentive variants that all Diamond accounts qualify for. The cover art is by Kevin Nowlan. Since the art has nothing to do with the story content which is the first solo Obi-Wan Kenobi tale, I can only guess this is suppose to be Chewbacca carrying C-3PO from The Empire Strikes Back movie. It is decent enough art, but like many of these Star Wars variant covers, there is nothing memorable about it. The first TELEJunior series ran for 42 issues from September 1977 to October 1980. This full colored magazine lives up to its billing as le magazine de bandes dessinées et de la télévision or the magazine of comic strips and television. The comic strips feature characters from Hanna-Barbera and Marvel as well as the Japanese Goldorak or Grendizer among other license properties. Interspersed with the comic strips are articles about television shows, movies, music stars, and other pop culture that appealed to young kids. 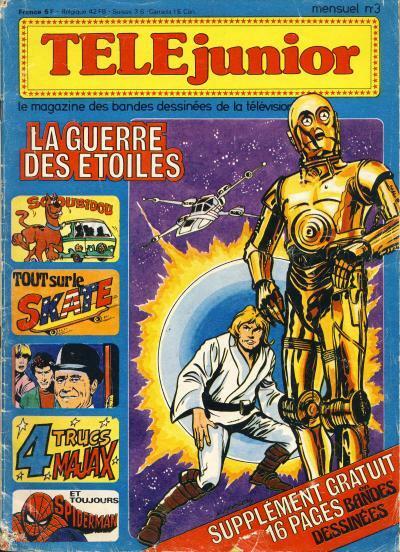 TELEJunior #3 has two short 2-page Star Wars articles titled les Etranges Robots de la Guerre des Etoiles or The Strange Robots from Star Wars and le Western de L'Espace or The Space Western which show several photos from the movie. Stapled to the center of the magazine is a small 16-page black and white supplement which is the interesting content to Star Wars comic fans. The 16 pages are from Star Wars #1 and measures 5 1/2" x 8". 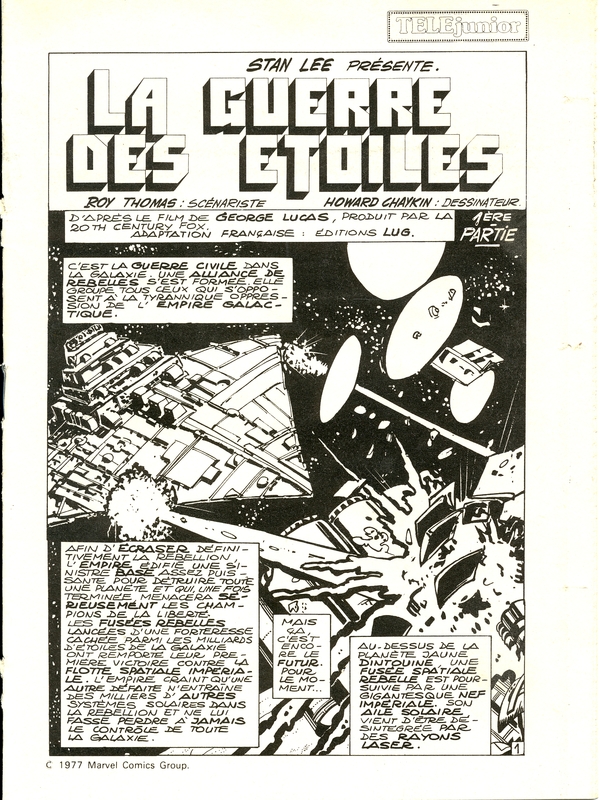 In order to fit the 17 pages from the U.S. Star Wars #1 into 16 pages, pages 15 and 16 from the U.S. comic are combined to make one page in this supplement. To do this, they took the first two panels from page 15 and added the first and last panel from page 16. Missing are the panels where the Tusken Raiders spot Luke Skywalker's Landspeeder and mount their Banthas as well as R2-D2 warning Luke of the Sandpeople approaching. It is also worth pointing out the supplement does not have a cover. 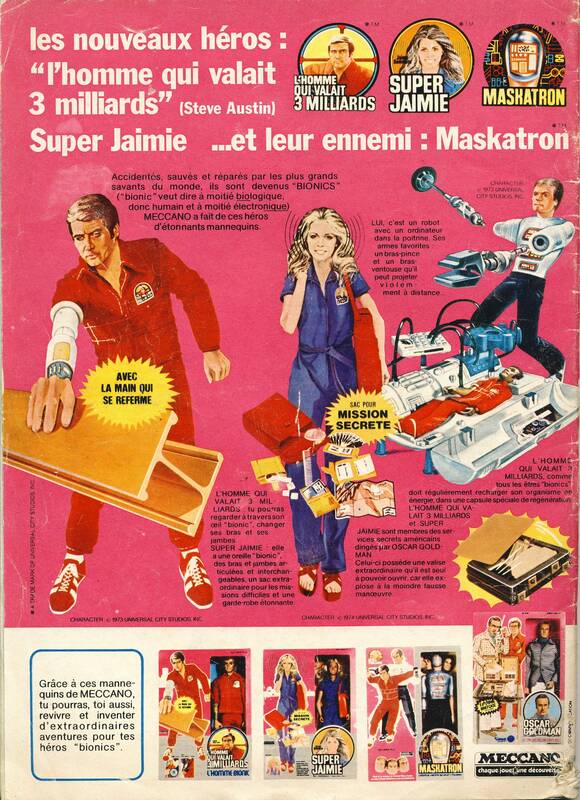 The back cover of the magazine has a cool ad for 6 Million Dollar Man toys from Meccano, the licensee of Kenner toys in France. The Steve Austin doll is the 3rd version of the character released which has a bionic grip. Instead of costing 6 million dollars however, the French version of the Bionic Man is a mere 3 million dollars as is shown in the text l’homme qui valait 3 millions or the 3 million dollar man. Other dolls shown are the Bionic Woman, Maskatron, and Oscar Goldman. Maskatron served as Steve Austin's sole enemy until the introduction of the Bionic Bigfoot doll. Early solicitations of the 15" Chewbacca doll in 1978 show a painted Bionic Bigfoot inside the box! The new "classified" ongoing Star Wars series from Marvel is Doctor Aphra. I'm sure there is more than one fan who will be happy with the announcement. Both the ongoing Star Wars and Darth Vader titles had annuals released in December 2015. The original Marvel series had 3 Annuals with stories that did not tie into the main series. These new annuals are important to the ongoing series, and in the case of Star Wars Annual #1, a character is introduced that will be the main antagonist in the Rebel Jail arc in Star Wars #16 - 19. Eneb Ray is a human Rebel spy embedded into the Imperial bureaucracy on Coruscant. He goes by Tharius Demo, an Imperial tax collector, which gives him access to information that he passes on to the Rebellion. In Star Wars Annual #1, Princess Leia gives Eneb a mission to free anti-Imperial Senators being held prisoners at the Arrth-Eno Prison Complex on Coruscant. He infiltrates the prison and learns from the captors that Emperor Palpatine is coming to the prison to interrogate the Senators prior to their execution. As Eneb is preparing to contact Leia about the opportunity, he runs into another Rebel spy, Coleet, who helps him secure the transmission. Leia agrees this is a good opportunity and goes along with Eneb's plan to assassinate the Emperor. Leia has contacted the other Rebel agents on Coruscant who, along with Ene,b attack Palpatine and his guards. Eneb kills who he thinks is the Emperor only to discover he was a decoy and the real Emperor had planned the entire charade. The Arrth-Eno Prison Complex is destroyed with the Senators and Rebel agents including Coleet, while Eneb escapes. In addition to eradicating the Rebel agents from Coruscant, the Emperor uses the destruction of the prison as propaganda against the Rebellion and Eneb Ray flees Coruscant. 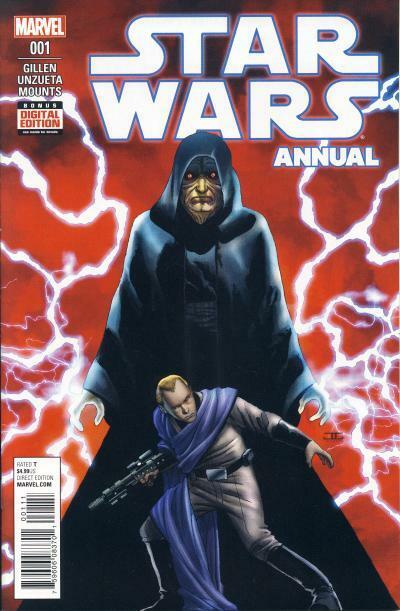 Eneb Ray is shown in front of a looming Emperor Palpatine on the standard cover. Eneb Ray: So you do remember me? Princess Leia: You were one of us. The best spy we ever put in the field. After Coruscant, we looked all over for you. We though you must have died with the others. Eneb Ray: Oh, his touch will definitely kill me. It's just going to take its time. Eneb Ray survives Star Wars #19 and it is only a matter of time until we catch up with his latest exploits. Speculation Spotlight: Sana Starros in Han Solo Movie? A rumor from 2 months ago has been making the rounds again last week. Lucasfilm is looking to cast a non-white female lead for the Han Solo movie. Almost immediately, speculation began that this character is Sana Starros. Sana first appeared in Star Wars #4 as an unnamed masked character who is searching for Han Solo. She appears again, also unnamed and masked, in Star Wars #5. 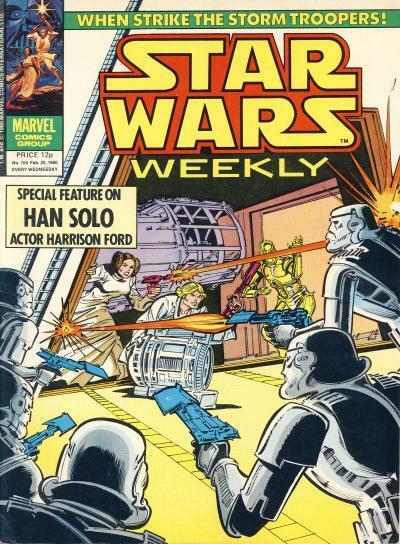 Toward the end of issue #6, she confronts Han and Princess Leia and claims to be Sana Solo. We learn in Star Wars #12 that Han and Sana were never really married, but the marriage was part of an elaborate ruse they concocted for a heist. The earliest postings I could find concerning this rumor are from August 10th. We Got This Covered published Han Solo Movie May Be Casting A Non-White Female Lead; Could It Be Sana Solo? and MovieWeb published Is Star Wars Han Solo Movie Casting Sana Solo? Many of the articles since then have pointed out this rumor, no doubt picking up this tidbit from the original articles. It is pretty typical for these movie sites to borrow rumors from one another, unfortunately leaving their sources uncited. As of yet, this is just speculation however as no official word has come from Lucasfilm. Trans World Entertainment is a publicly traded company that opened its first retail store, Record Town, in 1973. It spent the better part of the 1980s, 1990s, and early 2000s expanding the number of retail stores through growth and acquisitions. It's mall retail stores and retail website were consolidated under the For Your Entertainment brand in 2001 specializing in entertainment media. 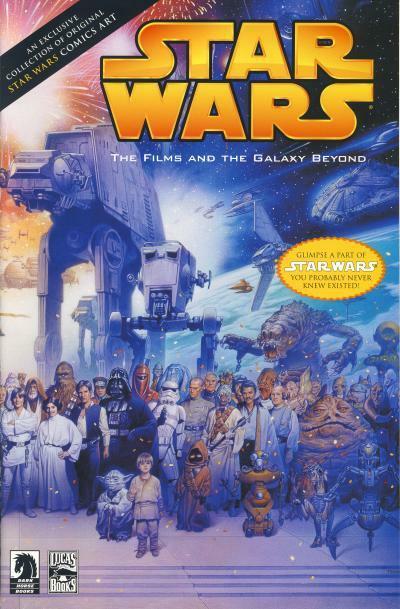 In November 2005 For Your World Entertainment gave away the Star Wars: The Films and Galaxy Beyond comic with purchases of the Revenge of the Sith DVD. This comic consists of covers from several Dark Horse titles from around the time it was released. The wrap around cover is a poster by Tsuneo Sanda that was released to celebrate Star Wars' 25th anniversary. Sanda is a Japanese artist who also produced original cover art for other Dark Horse Star Wars titles, including the Attack of the Clones adaptation and Darth Vader and the Lost Command mini-series. The Alan Moore issues of the British The Empire Strikes Back Monthly are well known due to the popularity of the writer. They were not published in the U.S. until 1996 when Dark Horse included them in a 2-part mini-series titled Classic Star Wars: Devilworlds. 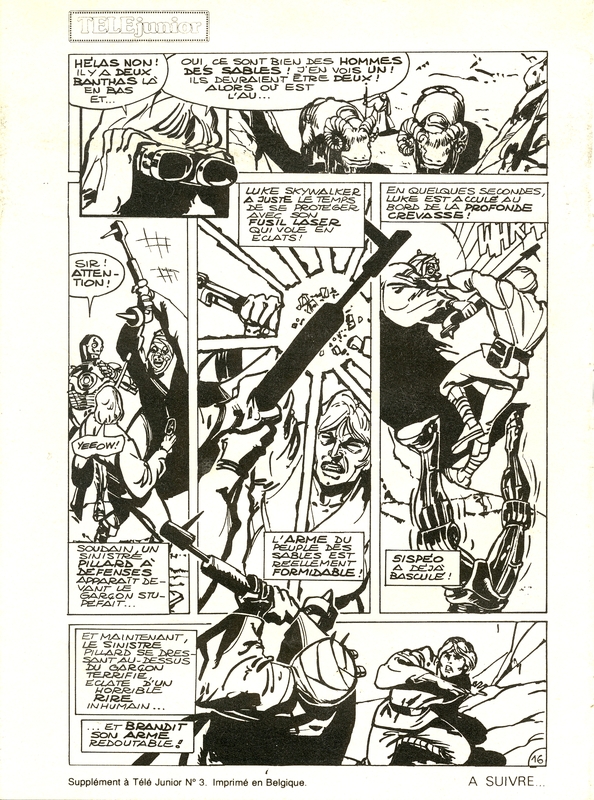 Alan Moore's stories are unconventional Star Wars stories but they are not the only unusual original stories published in the British comics. A story included in the Devilworlds mini-series called The Flight of the Falcon is written by Steve Parkhouse and does not have the same notoriety as the Alan Moore written stories, but it is strange nonetheless. 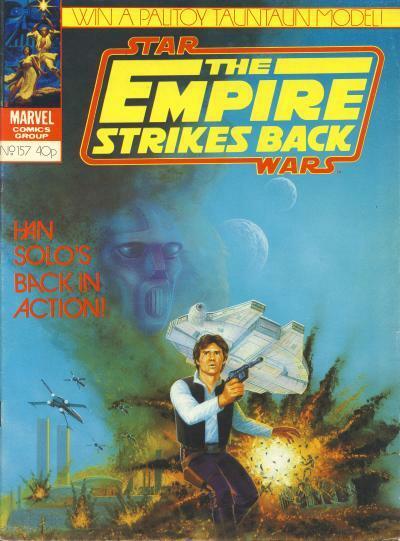 It was originally printed in The Empire Strikes Back Monthly #157. The story begins with a history of the Empire's border regions where pirates and smuggler operate with impunity as another smuggler eludes an Imperial patrol. One of the pilots from the patrol is reprimanded by an Imperial officer Tarkin. Tarkin is not named nor is his rank revealed, but the likeness is clear. The pilot explains their space craft cannot keep up with the spaceships used by the smugglers, so an Imperial delegation led by Tarkin makes a trip to the planet Tharkos to visit a Millennium Astro-Engineering plant. There they negotiate a deal to buy the Millennium Falcon prototype from the plant's director, Zoltan Starbuck. Interestingly, the character is called Starkid the rest of the story. Starbuck's secretary overhears the conversation and travels to the nearby town of Leviticus to inform Han Solo of the prototype. Han Solo is in shadows and his face is not seen but it is clear he is the one receiving the tip. The day the Millennium Astro-Engineering corporation is to deliver the craft, the Imperial pilot and his entourage are attacked on the way to the plant. The three attackers pretend to be the Imperials to take possession of the Millennium Falcon. Once in space, two of the three imposters turn out to be Lando Calrissian and Han Solo. Solo tells the Rebellion about the deal between Millennium Astro-Engineering and the Empire, so the Rebels send X-Wing Fighters to destroy the plant on Tharkos, killing Zoltan Starbuck. Needless to say, this story is not considered part of the continuity of the Expanded Universe. Also in The Empire Strikes Back Monthly #157 is the second half of Star Wars #57. The cover shows the Millennium Falcon being flown from Tharkos while X-Wing Fighters attack the plant. In the foreground is Han Solo and the masked visage is the disguise Han Solo used to trick Starbuck into releasing the Falcon to Han and his group. The cover story used is Han, the pilot, was injured years earlier and those injuries necessitated the use of the mask. To say this story is weird is an understatement. From the Empire dealing with the Millennium Astro-Engineering corporation, to Han Solo notify the Rebellion of the deal, this story is full of ideas that are outlandish. There are also several times in the story where the thought balloons are directed at the wrong character which adds to this story's bizarreness. In celebration of Star Wars Day on May 4th, 2016 and to help promote their recent Star Wars trade paperbacks, Marvel released 10 comics under the True Believers brand for only $1. One of those comics is a reprint of Star Wars #1 from the remastered (recolored) hardcover version of the movie adaptation that Marvel published in early 2015. The same cover and interior pages were also used on the IDW micro-comic. 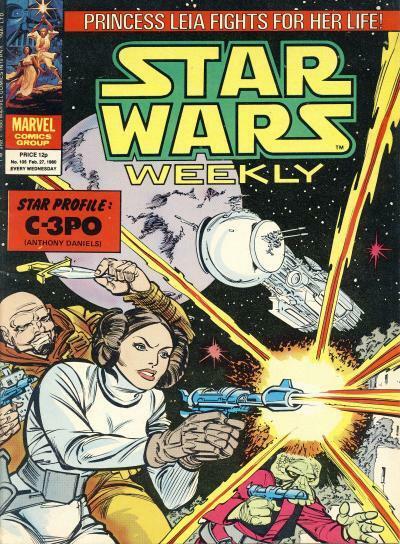 Princess Leia received a solo story, The Weapons Master!, in Star Wars Weekly #104 - 106 following a story, Way of the Wookiee, for Han Solo and Chewbacca in Star Wars Weekly #94 - 96 and another solo story, The Day After the Death Star!, for Luke Skywalker in Star Wars Weekly #97 - 99. These stories were all original for British readers because the Star Wars Weekly comic had run out of U.S. content to publish. Almost two years later, in November 1981, they would be collected for U.S. readers in the Marvel Illustrated Books Star Wars paperback. Imagine being a Star Wars fan in the U.S. in the early 1980s, eager to consume every piece of Star Wars literature and then finding out British readers were getting original content! These stories were a virtual gold mine for the furtive imagination of young Star Wars fans! And here is a tale that tells us how a Senator from a peaceful planet Alderaan with no weapons learns how to use a blaster! Giles Durane: Speed ... accuracy ...! Always knew ... someday ... in right circumstances ... you'd g-get it ... perfect ...! Princess Leia: I had a good teacher, Giles. With tears streaming down her face, Leia falls to her knees weeping as Giles dies. C-3PO: Yes, Artoo, that story was sad as her highness said it would be. But I recommend that you don't dwell on it--- ---you know what excess moisture does to your gearbox! Besides, I believe we can take comfort from the fact that as a result of Gile Durane's teaching-- --and the Princess's application of it back at the spaceport, our own particular adventure is ending quite happily! 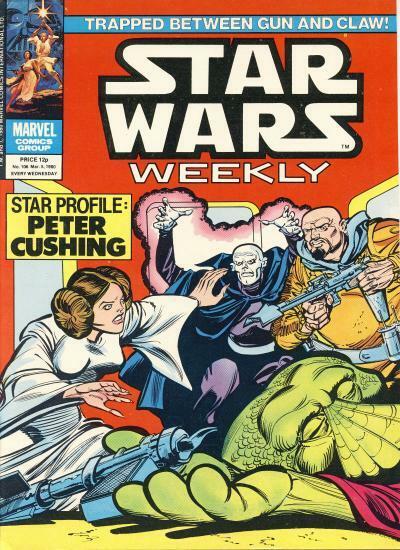 Star Wars Weekly #105's cover shows a scene that never happens in the story. Princess Leia is using a blaster while Giles Durane prepares to throw a knife and Gimlet stands ready to assist. Giles Durane's spacecraft is shown in the sky above Challon. On the final cover, Gimlet lies dead with Princess Leia reaching for his gun. Both Torgas and Giles look ready to attack Leia, another situation that never occurs in the actual story. 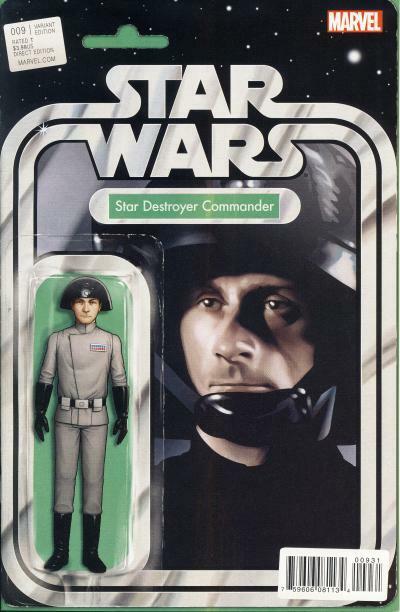 When Star Wars #9 was released, many pointed out the similarity between the Star Destroyer Commander on the action figure variant cover and Steve Carell. 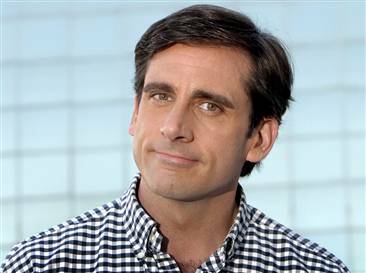 Carell is best known for his role as office manager Michael Scott on the American version of The Office sitcom. What do you think? Is the Star Destroyer Commander modeled after Steve Carell?